Hello everyone! Novint's Game Team has been hard at work to continue adding new titles to our Online Game Store. Today's preview is one of my favorite games, Feelin' It: Arctic Stud Poker Run. I was able to score a preview of this game (ah... the perks of working for the company) and it is so much fun! I promise, you've never played cards like this before! A first-person racing, shooting, poker-playing extravaganza, Arctic Stud has been described by various reviewers as "a fantastic concept", "a refreshing change", and "a mixture of high speed racing and blazing guns." In this game, the normal poker rules apply – the player with the best 5-card hand wins the pot. 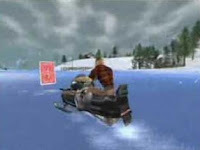 The only difference is that in Arctic Stud Poker Run you play on snowmobiles, you assemble your hand using cards scattered throughout the wilderness, and you can attack other players with guns, missiles, and more! With the Falcon you’ll feel every bump and twist as you play. The game is available for $29.99 at Novint's Online Game Store. I promise you won't be disappointed! Copyright 2007 Game Refuge Inc.